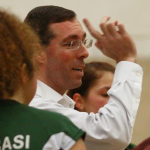 In volleyball coaching circles the idea of a “Commandments of Serving” has long been around. Even back in the days of sideout scoring when it didn’t hurt quite so much to miss a serve there was a list of times to make sure to get the ball in. Here’s the list I’ve put together, arranged in no particular order. Please note that what I’m about to talk about needs to be viewed in conjunction with the decision you make on how aggressive you want your team to be from the service line. It’s pretty obvious why you don’t want to miss a serve when it’s set point against you. No need to give the other team the win on a platter. If you have set point you want to make the other team fight it off, not be able to breathe a sigh of relief. Obviously, it’s different when your team is well up on points, but even still you’d like to avoid given the other team any hope of a comeback. You don’t want to miss the first serve of a set for obvious reasons. No sense giving the other team the first point without a fight. Even more, you don’t want to blunt a team’s enthusiasm coming out of the break with an error right away. In the case of timeouts and subs, this is especially about not letting the other team break your momentum. They are often both used to “ice” the server. You’d rather not make the other coach look good by missing then (though it doesn’t work as much as you might think). As to the officials’ timeouts, that’s mainly having to do with contested calls, scoring issues, and the like. The energy can flag during these breaks and the other team may be distracted (and/or angry that the call went against them). Missing the serve lets them off the hook. The first entry here has more to do with the individual than the team. 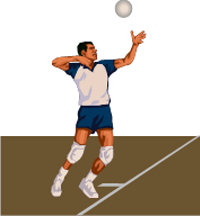 A player who misses straight serves, especially if the first miss did not follow a string of service points, risks putting them in a negative head space. It could not just negatively impact future serves, but their overall play. Even if there was a string of points scored before the first miss, there are reasons not to want to see consecutive errors which I will get into below. In terms of missing after the player before missed (teammate or opposition), this is about not giving the other team a chance to build momentum. If they miss a serve and then you miss one, not only don’t you punish them for doing so, you give the initiative right back. And if you miss after your teammate misses you kill any chance you might have to develop momentum and probably give it to the other team. A really painful example of this came when I was coaching the EUVC Men in the 2013 BUCS Super 8s. We were playing Cambridge in the last match of pool play. We’d won the first set without too much strain and were ahead in the second. Then we missed a string of I think four serves in a row (maybe 4 out of 5). It was the turning point of the match. It let Cambridge catch us and we never got the momentum back, going on to lose that set and then the decider. Even worse, the team wasn’t able to recover from the reversal and played poorly in the crossover match which followed. The first two are situations similar to when someone makes a great up on defense or chases a ball down off the court. The last thing you want to see in those cases is someone then putting the ball into the net. It wipes out all the good feelings the prior play generated. A missed serve after a hard-fought rally does the same thing. In the case of when the other team has scored a string of points, the situation is a bit reversed. There is usually some sense of relief to breaking their serve (particularly if it was a long string). A missed serve at that point tends to create a “Here we go again” sort of feeling. At least try to give your team a chance to shake off the recent struggles. Obviously, if you’re playing a balanced team this sort of consideration won’t come to mind. However, if they have an absolute stud hitter, for example, you probably don’t want to accelerate their return to the front row by missing serves. In the instance where your team is the markedly better of the two, missed serves are hard to justify. You don’t need to be aggressive to win (see this post). The one excuse is that perhaps you want some players to work on their more challenging serves. Even still, you have to be cautious because several missed serves can suddenly make a match uncomfortable. This happened with the Devon Ladies during the 2013 South West Championships. During the round-robin part of the event we were playing a team of lower quality, but one good enough to put up a fight. At one point four of our serves were missed in a row, allowing the other team to claw back into a potentially threatening position. As soon as we got back to making our serves we pulled away, but for a while we gave the other team some hope, which can be a dangerous thing. You may have observed in my comments above that a lot of the reason for not missing serves at certain times comes down to grabbing or maintaining momentum. We all know how important momentum and psychology are in volleyball. It needs to be encouraged and cultivated in any way we can. 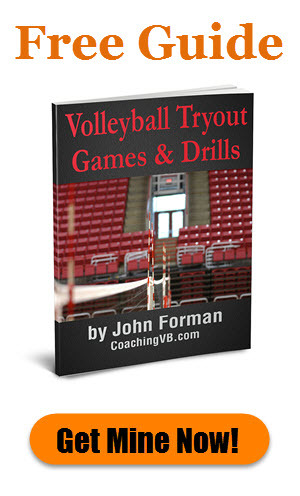 Make this your focal point when looking at serving, and other parts of the game as well. It’s not enough to think about when a serve needs to go in during matches. The mentality needs to be integrated into player’s minds during training. Make sure there are consequences during drills and games for missing serves at bad times. That will reduce (though I very much doubt totally eliminate) bad misses during matches and make your life on game day just a little less stressful.